Coming with your friends and family but not planning to zip?? your friends zipping overhead on our guided ATV tour. Call us at 855-386-9477 to schedule your tour! Some GPS Systems are Inaccurate. Please Check Our Directions Tab for Detailed Directions. 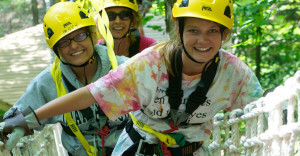 Purchase a Shawnee Bluffs Canopy Tour Gift Certificate online and print it immediately! The perfect gift for the thrill-seeker in your life. 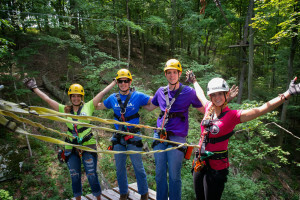 Shawnee Bluffs Canopy Tour consists of 8 zip lines, 3 suspension bridges and 3 short hikes. Approximate tour time 3 hours. The cost of your tour includes logo-free digital downloads of all of the pictures from your tour. Chipmunk Canyon Run consists of 5 zip lines, 2 aerial bridges and 2 short hikes. Approximate tour time 2 hours. 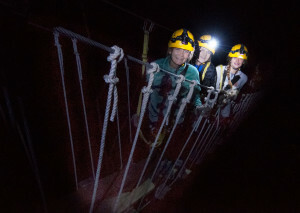 Shawnee Bluffs Night Tour consists of 8 zip lines, 3 suspension bridges and 3 short hikes illuminated by the full moon. Approximate tour time 3 hours. *Night tours are available upon request. Requires a minimum of 6 people in your group. Please call or email for more information. MAKANDA — Illinois’ first entirely tree-based, eco-friendly zip line canopy tour, located on 83 wooded acres surrounded by the Shawnee National Forest.Shawnee Bluffs Canopy Tour consists of eight zip lines, the longest stretching more than 1,100 feet, which will zig-zag across the property’s bluffs and through the valley. The tour also includes 11 platforms high in the trees, three aerial suspension bridges, the longest stretching 180 feet, and three short ground hikes.A canopy tour is an exciting way to experience the flora, fauna, geology and history of the outdoors by safely traversing an established route of ziplines and aerial bridges between platforms built in the trees, and they are just plain FUN! A canopy tour’s purposeful utilization of the natural terrain coupled with an intentional low environmental impact delivers an adrenaline-filled adventure and educational experience!